An offender high on horse sedative mugged a 76-year-old woman for cash to pay for even more drugs. John Carr (22) had been on a ketamine – an animal anaesthetic – bender for days before attacking the elderly woman and tearing her bag from her body in Cow Wynd, Falkirk, on May 6. Falkirk Sheriff Court heard Carr had been with “acquaintances” in Falkirk High Street shortly before the 10pm attack. Prosecutor Ruaraidh Ferguson said: “He had been discussing robbing people to obtain money for drugs. His acquaintances thought he was joking. Unfortunately he was not. “The first thing the victim was aware of was that somebody was grabbing her neck. Initially she thought it was a friend playing a trick on her. She had her handbag worn across her body, and strap was pulled by the accused, causing her to fall to the ground. The woman was treated for shock by paramedics, and had bruised her elbow when she was pulled to the pavement, but she was not seriously hurt. The whole incident was caught on CCTV and Carr was quickly traced and arrested. 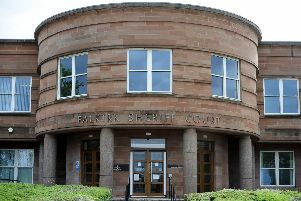 Carr, of Falkirk, pled guilty to assault and robbery, causing injury. The court heard less than a week before the incident Carr had been released early, from a 20 month sentence for theft by housebreaking, in which he had raided a home while the householder was asleep upstairs. Sheriff John Mundy jailed Carr for 26 months.